Establishing the business in 1993 in Cornelius, Oregon, Keith Green Construction continues to service the Portland Metro Area and beyond. Keith Green involves his family within his business, creating a solid communication and support network within the company. Grown to more than 25 employees, Keith Green Construction continues to rely on and employ skilled craftsmen, all of whom are honest and professional in all aspects of their trade. With a quality management team committed to excellence, Keith Green Construction is a paragon example of quality within the Northwest. Keith Green strives to continually assert his company’s expertise in dry rot repair and fire and water-damage restoration. Their proactive approach toward sustainable and green construction and installation portrays their care for the Northwest. For about 16 years now, Keith Green Construction has constantly maintained an unmovable foundation of quality customer service and satisfaction. The relationships that we create with clients ensure that they return if they require more home-improvement needs. 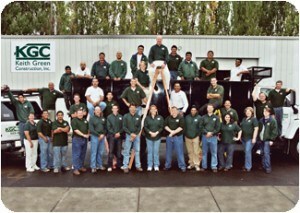 We are licensed, bonded and insured in Oregon and Washington. OR CCB #109148 – WA #KEITHGC948KH. Our mission is to ensure the creation of strong relationships between us, as contractor, and client. Maintaining an unprecedented foundation of customer service, support and the highest level of satisfaction through our products and services. Dedicating the highest effort toward open, honest and productive communication. We stand by and believe our products and services are for a greener world, and will delight our customers, the community and beyond.